Johann Gutenberg is nearly universally credited with being the inventor of the printing press, and the father of the modern printed book. Gutenberg was an early communications catalyst who invention of the printed book opened up the world to the quick and efficient spread of knowledge and ideas. Despite Gutenberg's cultural status as the forebear of the modern book production process—Time magazine named him "Person of the Millennium" in 1999—relatively little is known about the details of his life. Johann Gutenberg was born into an upper-class family of goldsmiths in Mainz, Germany around 1395. Much of what else we know about Gutenberg's life is through legal documents of his time. For example, he promised to marry someone but didn't, and she took him to court; and he owed money from what seemed like a get-rich-quick scheme involving selling baubles to religious pilgrims. Tidbits of information from these and other legal documents and intense scholarly investigation suggest Gutenberg was a man passionately dedicated to the idea of the mass production of printed pages, an inventor who borrowed money in order to see his work through to completion—and one who was extremely secretive about his ideas while they were in development. One person who lent Gutenberg a substantial sum was Johann Fust. Fust eventually sued to get back his money and the accrued interest and seems to have taken over the original press, which had been put up as collateral. Gutenberg continued his printing career and appears to have continued modifying printing methods to enable additional efficiencies. At the end of his life, he was granted an allowance from the archbishop of Mainz for food and clothing, suggesting he lived out his days in relative comfort. Some conjecture that Gutenberg's exposure to metal casting methods in the family goldsmithing business gave him the skills necessary to create the individual, reusable letters cast in metal—the "movable type"—to set pages. While the Chinese invented a form of movable type about five hundred years earlier and continued to make improvements to their methods, restrictions of the language, religion, culture, and materials kept the technology from widespread use. 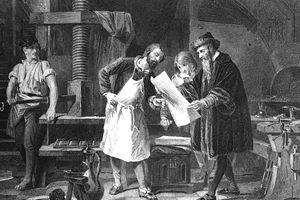 Whatever inspired Gutenberg to his printing ideas, he needed to have worked extremely diligently in a variety of subject areas—what we know now as chemistry and mechanical engineering—to bring the printing press to practical application. His metal type necessitated his invention of new, oil-based inks that would stick to the type. It also necessitated the creation of a device that could transfer—"press"—the ink evenly onto the pages. It's assumed that Gutenberg used a screw press to print his books. Similar devices were at the time used to make paper and to press grapes for wine. Improvements in paper production brought costs down and made the paper a viable substance for books, more economical than vellum. The Gutenberg Bibles, which dates from the 1450s, are considered to be the first books printed in the Western world and, although they don't bear the printer's name anywhere in the volumes, are attributed to Gutenberg's first printing efforts. Several of these are in the possession of the Morgan Library and Museum in New York City and are frequently on display. Prior to the invention of the printing press, books existed in codex form; that is, books were hand-copied and a Bible would take around two years to produce. Most of the general public would have seen a book—that Bible—only in church, and all but the wealthy and learned would likely have to travel to get a look at one of the classic texts such as Homer's Illiad. As book printing-publishing was established as a business, the first book trade fair was established in Frankfurt, Germany, not far from where Gutenberg printed his first Bible. The efficiencies of using movable type and a printing press to produce books quickly paved the way for the mass production of books and other reading material, including printed handbills advertising these early books—the first book marketing! Printed information caught on quickly as a method of communication. For the first time in history, ideas were literally put in the general public's hands in the form of the printed word, and book publishing enabled knowledge, thoughts and culture to spread at a rate faster than ever before. Read more about pioneers in the book industry, Barnes & Noble's Len Riggio and Jeff Bezos and Amazon.com. What Was the Earliest Form of a Bound Book?